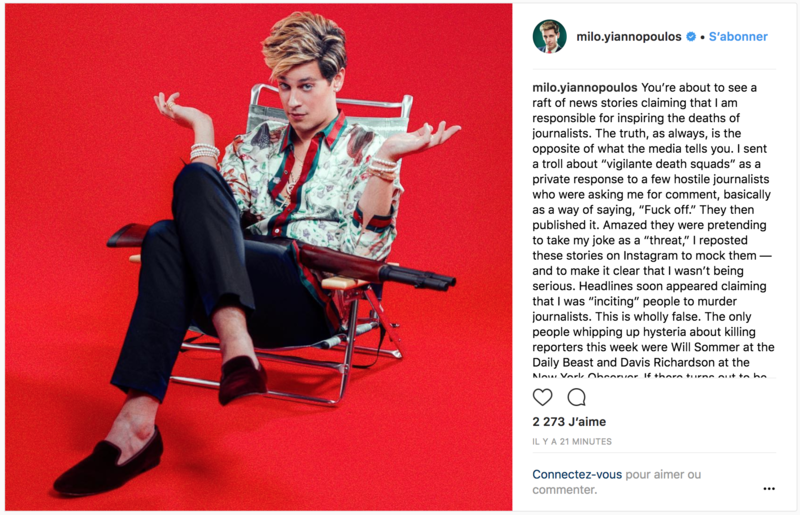 Yiannopoulos’s comments about “gunning journalists down” were first published earlier this week by The Daily Beast and the New York Observer. Law enforcement had released only bare details of the newspaper killings when Yiannopoulos took to Instagram about the matter. There was no indication of the shooter’s name or motive. Still, a number of Twitter users had already brought up his remarks in light of the shooting. Last week, Yiannopoulos used PayPal to attempt to troll a Jewish journalist by sending her $14.88. The number 1488 is a popular hate symbol in white supremacist and neo-Nazi circles — 14 is used to represent the “14 Words” mantra about securing “a future for white children,” while 88 is a shorthand for “Heil Hitler,” the letter H being the eighth letter of the alphabet.